This project studied the effectiveness of four interventions designed to bolster safe performance among healthy older drivers: (1) Classroom driver education with supplemental behind-the-wheel instruction; (2) Computer-based exercises to improve speed of processing and divided attention; (3) Clinical occupational therapy-based exercises to improve visual skills and attention; and (4) Physical conditioning to improve strength, flexibility, and movement. Seventy-eight drivers 65 and older were randomly assigned to one of the four treatment groups or to a control group that completed activities unrelated to driver improvement. Training effects for each intervention were gauged in relation to the common control group using two types of measures. First, measures of effectiveness emphasized tactical driving skills demonstrated through on-road assessments conducted by a Certified Driver Rehabilitation Specialist (CDRS). Next, performance on a driving simulator was measured for various attention and divided attention tasks. Both types of measures were obtained before training, immediately following training, and three months post-training. For the on-road assessments, only the OT-Administered training group and the classroom + BTW training group demonstrated a significant gain relative to the control group, in the percentage of drivers with skill deficits at the pre-treatment assessment who improved their skills on the immediate post-treatment assessment. None of the treatments demonstrated significant gains on the three-month post-treatment assessment, relative to controls. There were no significant gains for any of the treatment groups on post- versus pre-training performance in the simulator tasks. 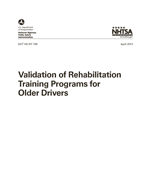 The positive findings for the OT-Administered visual skills training points to a new opportunity for those professionals without the relatively scarce "driver rehabilitation specialist" certification to enhance seniors' safety behind the wheel. The development of on-road evaluation methods using scales with interval properties is also recommended.